Electromagnetic fields (EMF) exist just about everywhere in our atmosphere. Urban locations in particular have a diverse and vibrant hertzian culture, with mobile phone calls overlapping text messages, combining television broadcasts with garage door openers that interfere with radio transmissions and wireless laptops, etc., not to mention the natural EMF that already exists in the atmosphere. This project is a spatial investigation of some of these phenomena. 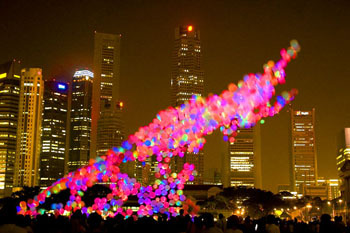 Sky Ear is a non-rigid carbon-fibre “cloud”, embedded with one thousand glowing helium balloons and several dozen mobile phones. 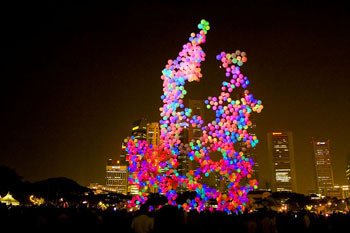 The balloons contain miniature sensor circuits that respond to electromagnetic fields, particularly those of mobile phones. When activated, the sensor circuits co-ordinate to cause ultra-bright coloured LEDs to illuminate. The 30m cloud glows and flickers brightly as it floats across the sky. As people using phones at ground-level call into the cloud (flying up to 100m above them) they are able to listen to distant natural electromagnetic sounds of the sky (including whistlers and spherics). Their mobile phone calls change the local hertzian topography; these disturbances in the electromagnetic fields inside the cloud alter the glow patterns of that part of the balloon cloud. Feedback within the sensor network creates ripples of light reminiscent of rumbling thunder and flashes of lightning. Sky Ear shows both how a natural invisible electromagnetism pervades our environment and also how our mobile phone calls and text messages delicately affect the new and existing electromagnetic fields. 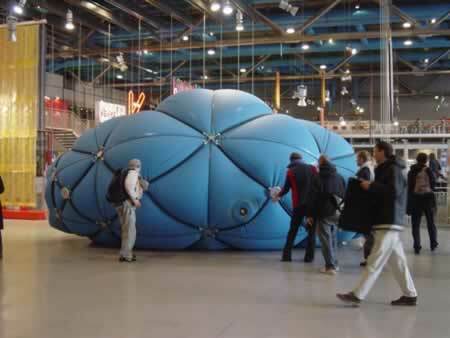 Bontron The MUSCLE programmable building is a pressurized soft volume wrapped in a mesh of tensile muscles, which change length, height and width by varying the pressure pumped into the muscle. Visitors play a collective game to explore the different states of the MUSCLE. 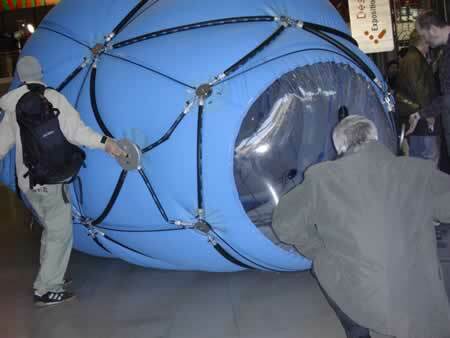 The public interacts with the MUSCLE by entering the interactivated sensorial space surrounding the prototype. This invisible component of the installation is implemented as a sensor field created by a collection of sensors. The sensors create a set of distinct shapes in space that, although invisible to the human eye, can be monitored and can yield information to the building body. The body senses the activities of the people and interacts with the players in a multimodal way. The public discovers within minutes how the MUSCLE behaves on their actions, and soon after they start finding a goal in the play.The outcome of this interaction however is unpredictable, since the MUSCLE is programmed to have a will of its own. It is pro-active rather then responsive and obedient. The programmable body is played by its users. A constant play of conjointly effectuating (re)actions, of attraction and repulsion between all players involved. This game truly is a multi-player game. Now true communication is established, where the pro-active parties involved alternately sense, process, and actuate in this constant loop of mutual influence. 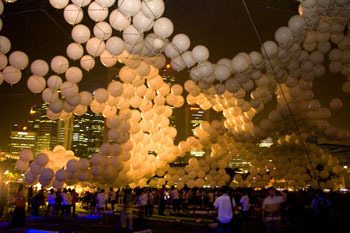 The players experience this parametric game of architecture as a form of serious fun. The playing of the game means setting the parameters. 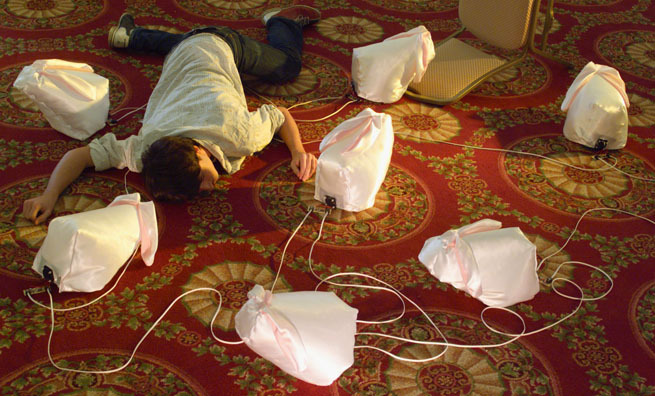 'Thoughts go by air' is a slowly evolving project within the domain of art and technology. 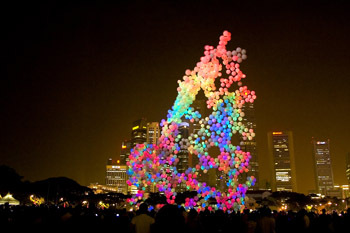 The first generation (2003) existed of a bunch of balloons strapped together by wires and reacting on human or its own movements. For the second generation (2004), mxHz.org developed its own electronics with a sonar, motor control and communication protocols. This allowed the artbots to sense the environment and communicate with each other either in the same room or over the internet to another location. Connections between Brussels, Berlin, and New York were succesfully established. ALAVs 2.0 (Autonomous Light Air Vessels) are networked objects that communicate the concept of connectivity among people, objects, and the environment. Through the use of mobile technologies people can influence the behavior of the ALAVs by starting conversations and building closer relationships with them. 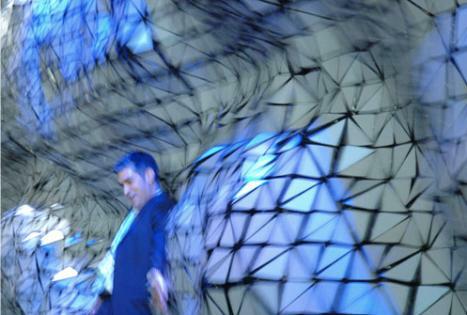 ALAVs 2.0 reflects upon the current state of connectivity in our everyday lives. The potential of ALAVs 2.0 lies in its ability to captivate a wide audience and communicate the idea of people cohabiting a shared space with networked objects. 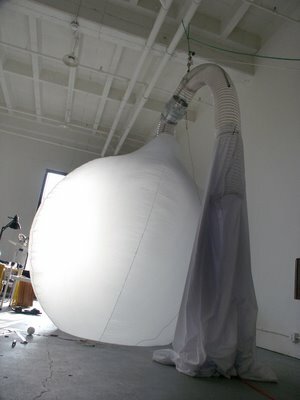 A project by Jed Berk, Julian Bleecker and Nikhil Mitter.